My internship required me to work 40 hours a week for a 6 month period. It wasn't paid. And it didn't really afford me the opportunity to work a job that occurred during normal hours. So, after some brainstorming and Craigslisting, I saw they were holding auditions for a dinner theater that was pretty much an institution in St. Louis. With my theme park performance background (still so proud of that, obviously), I knew I was likely to get the job so I went out and auditioned. The show was a bawdy musical comedy set in Henry VIII's royal court (the script for which had been around for 30+ years) where we were encouraged to joke around with the guests of the show, recommend the alcoholic beverages heavily, and basically have the time of our lives. It was AWESOME. That's me in the middle. 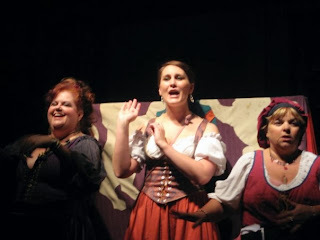 I proceeded to work there for the next two and a half years (up to and including my final show when I was 5 months pregnant with TIH - it was pretty fun to wear the costume with my baby bump peeking out of my bodice.) Sure, the extra money was a huge help and I absolutely loved the job, but the late nights weren't going to jive with the new baby. Doing the whole show and serving food & drinks while pregnant was hard enough. I knew I wouldn't have the energy once the new baby was in the picture. So, a few months before TIH was born, I hung up my bodice once and for all. In a way, leaving that job was one of the first major parental sacrifices I made. Giving up something I really enjoyed doing because I knew it would be better for my family in the long run. I have sincerely missed dressing up, interacting with the customers, and the tips didn't hurt, obviously. So, when I was contacted by Medieval Times - Chicago who was interested in doing a giveaway on the blog, I literally was pinching myself with happiness. Kicking myself for not reenacting this. After being there I can't believe the comparison was ever drawn. Mostly because this show had a much larger cast, was not a musical, featured staged combat (that was REALLY impressive), and oh yeah, they had actual HORSES. However, it still was a bit of a walk down memory lane and we had an incredible time. These tickets also tell you which knight you'll be cheering for. When we were finally led into the arena, it totally took my breath away. The lighting for the entire show is SURREAL, and I loved how each section started out being lit in its signature color. Plus, our seats totally rocked. We were immediately greeted by our server (who was unfortunately, not Janeane Garofalo), but who was extraordinarily great at his job. Soft drinks and coffee are included with the price of admission, so he took our drink orders and then it seemed as though he immediately was bringing us food. There are no utensils at Medieval Times (though they will provide a set for the kiddos, so no worries there.) Not that it mattered, TIH was SO excited to sip soup out of his bowl. I was shocked by how delicious the menu was. The food at my dinner theater was great, but in truth, you came for the entertainment not the food. So color me excited when the food at Medieval Times was just as awesome as the show! Utensils would have slowed me down too much. Throughout the meal you are entertained with some competitions between all of the knights where you are encouraged to cheer on your section's knight. We were sure to show our Yellow Knight pride all night long. I can totally pull off hats. There's never really a dull moment throughout the show. I think our favorite part was when our knight fought in a really exciting battle...and won. You'll hear me say "Whoa" when the swords keep sparking when they hit each other and then cheer like a crazy person when our guy won. It's really exciting and intense. Too cool. Spoiler alert: our knight won the whole tournament! (Don't worry, it isn't a real spoiler. The winner changes every show.) I can't explain how happy this made TIH. He had been cheering his little heart out and waving his flag and light-up sword for the whole show. There were moments when the cast actually came in the audience and a little girl in our section was actually named "Lady of the Realm" so the Yellow Knight stood right by us. He left the horse in the arena, unfortunately. One of the things I was most impressed by (and I know it's weird) is how much it did NOT smell like horses in there. Literally these giant, gorgeous animals were walking around right past us and I still didn't find anything unappetizing about it. I'm sure it is strange that I even thought about that, but whatever they are doing to deodorize those guys - it's working. All in all, it was an absolutely fantastic night. We have already discussed a return visit for some of our out of town guests. I can't even begin to describe how impressed I was by the caliber of the show, the quality of the food, and the excellence of the customer service. Truly, it was a night we talked about for weeks afterward. And (in a full circle fashion), having to give up the opportunity to perform in shows like this, just opened up the opportunity to enjoy watching them with my family. So, I know exactly what you're thinking. "Gosh, I wish I could take my family to Medieval Times - Chicago." GOOD NEWS. Medieval Times has generously offered to give one lucky reader FOUR tickets to see the show here in Chicago! Ready for the details? Hello, the first big sacrifice I had to make as a parent was when I realized I couldnt afford things I would have done before. Tanning, Makeup, hair products all got thrown to the wayside and were replaced with Diapers, Formula and baby clothes. I loved every minute of it though and still do!!! I am super excited for this giveaway liked Medieval times and all!! When does this end so I know when to check?